Raising 8 kids in the post WWII baby boomer age is hard to imagine, even after you’ve lived through it. As the 5th in line of 8 children, I can only imagine the grief my parents felt at moments behind the scenes. Despite any rough times, we managed to get away on vacation almost every summer, and camping on Sebec Lake in Central Maine was a favorite destination. Camping with a family of 10 was always an adventure and filled with warm, fond memories! 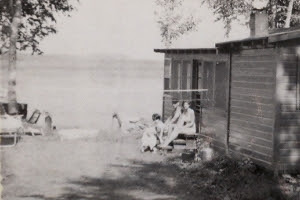 Several consecutive years my parents rented the cabin on Sebec Lake shown in the photo for an entire week. The last night of camp before we packed up and headed home, an annual tradition developed that became showtime for our neighboring campers; and probably a few a mile away on the Bowerbank side of the lake. Soon after dark my Dad would line up his 5 sons from oldest to youngest, and then take the lead as the show began. Early bedtime was typical when camping, so the timing of the show was just as some of the neighbors were nodding off. Forming a non-stop cycle running the length of the dock and yelling like Tarzan, we each made a dive into the lake, and scrambled on shore to get back in line. 6 males, each yelling as they dove in the dark, provided a wakeup call for some campers and a mystery. The range of voices was obvious. The commotion was not. The mystery was figuring out who, how many, and why. We stayed on each other’s heels, so as one was diving the previous showman was looping out of the way underwater, another was nearing shore as another scrambled to the dock, and the last two were spread out and running the dock to keep it going. It lasted 15 minutes. I’ll remember it forever.